When Don’t Deer Have Antlers? Home Other Articles Deer: When Don’t Deer Have Antlers? Deer (singular and plural) are the ruminant mammals forming the family Cervidae. They include, for example, moose, red deer, reindeer, roe and chital. Deer shed their antlers after the mating season  in the Northern Hemisphere, in early winter. A layer of specialized skin, called velvet, nourishes the growth of antlers and guides the formation and branching of tines. In the velvet is an intricate network of nerve fibers, which makes the tissue highly sensitive and is thought to keep the animal from treating its developing antlers too roughly. Antlers grow extraordinarily fast beneath the velvet  in elk and caribou, an estimated inch every two days. Nerve growth must keep pace, and nerve fibers in these animals’ antlers are believed by some scientists to grow faster than those in every other mammal. Not all deer develop antlers. 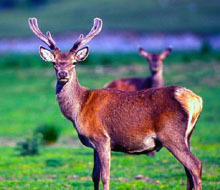 In most species  the white-tailed and red deer, for instance  only the males carry the headgear, using it to fight against rivals. In musk deer, however, neither the male nor the female has antlers. Serving somewhat the same function as antlers are three-inch-long tusks on the males.